One of the advantages of Face ID on the iPhone X is that – according to Apple at least – it’s very, very hard to fool, and the Cupertino brand says it’s worked to stop masks fooling it. But despite that, it seems a mask that can trick the iPhone X may already have been created. 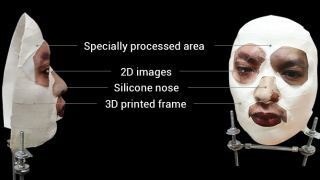 Vietnamese cybersecurity firm Bkav built the mask in under a week, for around $150 (roughly £115, AU$200), using a mix of 3D printing, 2D printing and a hand-made nose and skin. You can see the mask seemingly working in the video below, and interestingly the mask isn’t even a full-face replica, with Bkav noting that it only needed details for half the face to fool Face ID. Presumably the system has more freedom in that area to allow for it to still work when users are wearing glasses and the like. So should you be worried? Probably not, unless you’re someone high-profile who’s likely to be targeted, such as a CEO or high-ranking government official, as it's a lot, lot of work to go to in order to fool the system. This is still a proof of concept, so it may not reliably work or be easy to replicate, and it also looks like a lot of effort for a common thief to go to. If you are the sort of person who might be targeted though (and if you are, we've got an idea regarding magnetic mops we want to run by you) you might want to think twice about using Face ID to secure your iPhone X. In fact, Bkav reckons that fingerprints are still more secure, despite what Apple says. Without further testing it's not possible to corroborate this claim, but given that both these methods require a back-up PIN or password you might be best off skipping biometric security altogether if the contents of your iPhone are that sensitive.